Genome editing technologies have revolutionized biomedical science, providing a fast and easy way to modify genes. However, the technique allowing scientists to carryout the most precise edits, doesn’t work in cells that are no longer dividing – which includes most neurons in the brain. This technology had limited use in brain research, until now. Research Fellow Jun Nishiyama, M.D., Ph.D., Research Scientist, Takayasu Mikuni, M.D., Ph.D., and Scientific Director, Ryohei Yasuda, Ph.D. at the Max Planck Florida Institute for Neuroscience (MPFI) have developed a new tool that, for the first time, allows precise genome editing in mature neurons, opening up vast new possibilities in neuroscience research. Single AAV Systems for HDR-Mediated Genome Editing In Vivo (A) Schematic illustrations of experiments. 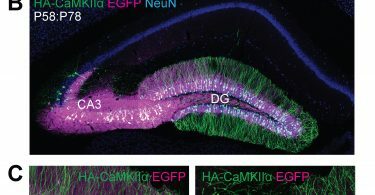 (B, C) Confocal microscopic images of coronal brain sections of the hippocampus of Cas9 mice, showing the EGFP fluorescence (B, C, magenta), immunoreactivities for NeuN (B, blue) and the HA tag (B, C, green) fused to the N-terminus of endogenous CaMKIIα. Dual AAV Systems for HDR-Mediated Genome Editing In Vivo (A) Schematic illustrations of experiments. (B) Confocal microscopic images of coronal brain sections of the amygdala of wild type mice, showing the EGFP fluorescence (B, magenta), immunoreactivities for NeuN (left) and the HA tag (green) fused to the N-terminus of endogenous CaMKIIα. (C) Confocal microscopic images of coronal brain sections of the striatum of wild type mice, showing DAPI signal (left), the mCherry fluorescence (magenta), the mEGFP fluorescence (green) fused to the N-terminus of endogenous CaMKIIα. This novel and powerful tool utilizes the newly discovered gene editing technology of CRISPR-Cas9, a viral defense mechanism originally found in bacteria. 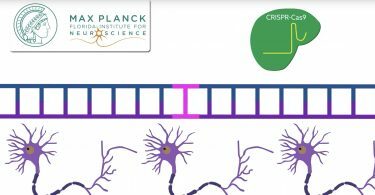 When placed inside a cell such as a neuron, the CRISPR-Cas9 system acts to damage DNA in a specifically targeted place. The cell then subsequently repairs this damage using predominantly two opposing methods; one being non-homologous end joining (NHEJ), which tends to be error prone, and homology directed repair (HDR), which is very precise and capable of undergoing specified gene insertions. HDR is the more desired method, allowing researchers flexibility to add, modify, or delete genes depending on the intended purpose. Coaxing cells in the brain to preferentially make use of the HDR DNA repair mechanism has been rather challenging. HDR was originally thought to only be available as a repair route for actively proliferating cells in the body. 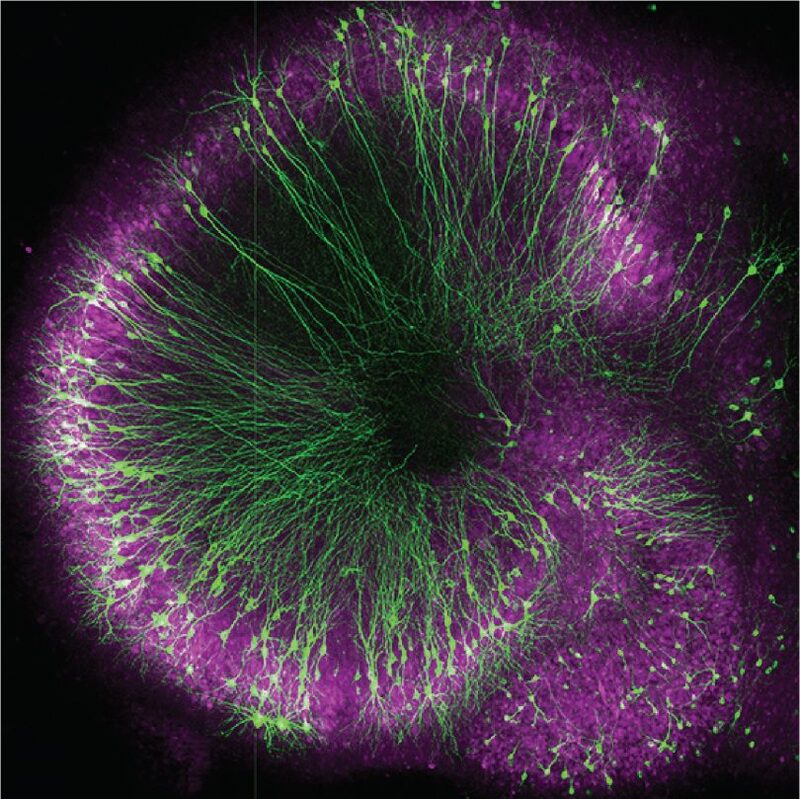 When precursor brain cells mature into neurons, they are referred to as post-mitotic or nondividing cells, making the mature brain largely inaccessible to HDR – or so researchers previously thought. 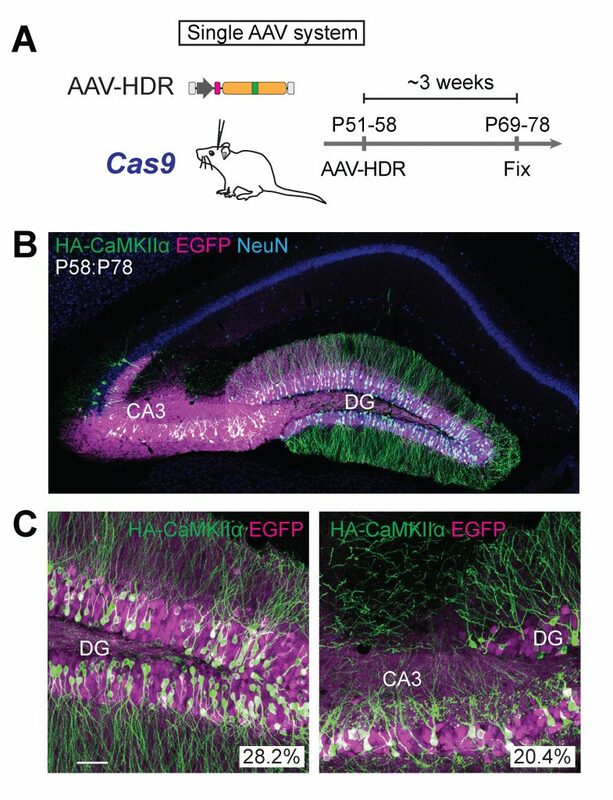 The team has now shown that it is possible for post-mitotic neurons of the brain to actively undergo HDR, terming the strategy “vSLENDR (viral mediated single-cell labeling of endogenous proteins by CRISPR-Cas9-mediated homology-directed repair).” The critical key to the success of this process is the combined use of CRISPR-Cas9 and a virus. Adeno-associated virus (AAV) is a low immunogenic, nontoxic virus utilized by scientists as an efficient delivery mechanism for all kinds of genes. This virus can effectively provide the donor template necessary for HDR, increasing its efficiency. 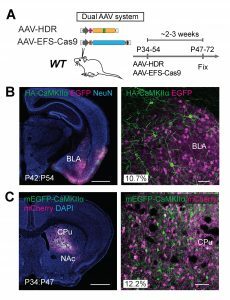 The team first packaged the necessary machinery for genome editing into the AAV and delivered it to neurons of transgenic Cas9 expressing mice, achieving spectacularly efficient HDR in post-mitotic neurons of the brain. They next created a dual-viral system allowing them to use the technology in animals that had not been engineered to express Cas9. They tested this dual-viral system in an aged Alzheimer’s disease mouse model showing that the vSLENDR technique can be applicable in pathological models even at advanced ages. vSLENDR is a powerful new tool for both basic and translational sciences alike, capable of the precise editing of genetic information regardless of cell type, cell maturity, brain region, or age. The new vSLENDR is more efficient, flexible, and concise, allowing researchers the potential to study a myriad of brain processes and functionalities with unprecedented ease. Equally important is its potential use in neuropathological disease models, accelerating research and the development of novel therapeutics; establishing today’s basic science as the foundation for tomorrow’s cures. This work was supported National Institute of Health, the Human Frontier Science Program and JST/PRESTO, Max Planck Florida Institute for Neuroscience and Max Planck Society. The content of this article is solely the responsibility of the authors and does not necessarily represent the official views of the funding agencies.